Like a riverboat gambler, the membership at Meadowbrook Country Club in Northville stacked its chips and went “all in” on a major renovation to its golf course. Accentuating its bold move, the course even closed for a year during its centennial! But in hindsight, the odds were in its favor as the club was blessed with a royal flush—savvy committee leadership, an informed membership and a gifted architect, Andy Staples. Having recently played Meadowbrook—a venerable Willie Park Jr. layout which hosted the 1955 PGA Championship and several other major state championships—let me join a chorus of admirers enjoying this stunning transformation. But before I share some comments about the playing experience there, let’s review the elements of the renovation. Staples distilled the project’s goals into three major parts: 1) sustainability in turf types and maintenance; 2) improvement of site drainage and playability; and 3) maximization of the overall property. In the first element, water consumption was reduced by over 50% and 25 acres of maintained turf was eliminated. For the second, a systematic site drainage plan was introduced—via 13 miles of new drainage!—for greens, bunkers and fairways which lent consistent, fast, and firm conditions. Thirdly, the charm of the Park design was retained by taking the layout back to its original roots but with a contemporary mindset. It’s that third element that particularly intrigued me. As a devotee of the classic period of golf design, I’ve seen so many vintage courses lose their way by poor and misguided tree plantings and management. When they were opened, these courses were linksy and sparse in design—just like the courses in Scotland and England. Plantings were later introduced by subsequent green committees with nary a thought to turf management and original design philosophy. As one Michigan architect told me, “gradually the parkland course look was more favored than the links.” Like so many other courses, Meadowbrook added trees to the layout and over time it altered both its look and its turf, and not to the best effect. In its renovation, Meadowbrook removed thousands of trees and opened up the property. Now when standing on its second green, you can look out and see virtually the entire course in one panoramic glance. “It’s inspiring,” I muttered to myself. Oddly enough, the remaining trees are now more stately and majestic. Less is more. 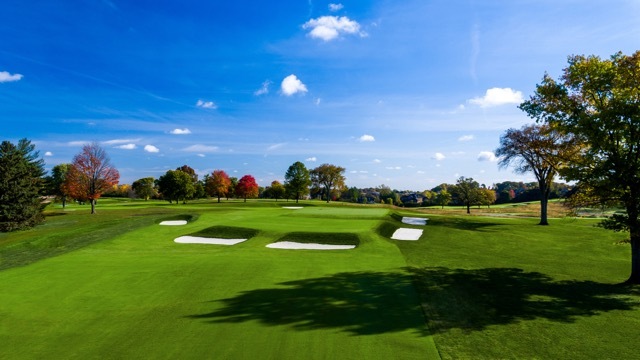 Credit Oakmont Country Club for leading this agronomic charge more than a decade ago when in the dark of night it began a massive de-forestation of its storied layout, bringing the course back to its linksy and barren origins. In all, more than 15,000 trees were removed from Oakmont where today there’s a single tree gracing the interior of the property. The other advantage of tree removal is how it enhances turf quality. Fewer trees mean more sunlight which promotes better growth and drainage and promotes faster and firmer turf. It’s also requires less water and fertilizer, resulting in savings to maintenance budgets. Along with the wider expanse and inviting personality of the course, I also greatly admired the quality of the new putting surfaces. All the greens were rebuilt and regressed with Pure Distinction bentgrass, a variety that is tolerant to heat in the summer and ice and cold in the winter. And its density is so tight Pure Distinction doesn’t allow poa annua any room to grow. The result is a fast and smooth putting surface where the ball rolls true. What more can one want? Tees were added and rebuilt where now there are ten sets of tees (counting hybrid tees) available to members, maximizing options for playability and enjoyment. And in consideration for hosting championship play, length was added so that the layout stretches out to a more robust 7026 yards. As further icing on its cake, the new Meadowbrook is embedded with a number of classic architectural features. You’ll find a punch bowl green, a Biarritz-style green, shaggy-haired bunkers, rectangular-shaped greens, and short walks between the green and the next tee. On this last point, I love the transition from the 12th green to the 13th tee where it’s all closely mown and of one piece. In a similar vein, Meadowbrook celebrated its centennial by planning for its next one. It was never a gamble after all. TOPICS: Courses and Travel, Golf	Tags: 1955 PGA Championship, Andy Staples, classic golf design, Meadowbrook CC, Michigan, Michigan golf, Northviile, Oakmont CC, Pure Distinction, renovation, Terry Moore, trees removal on golf courses, Willie Park Jr. I have the pleasure of working with Andy on the positioning of the two forward sets of tees. What he accomplished with these tees is to provide choices for players with slower swing speeds so that they could enjoy the playing the course in a way that will be fun for them. The 10 tee (with combos) is sheer genius and is a view into the future of golf.